The first I myself saw of it was from Amanda the Great, who started sticking them amusingly onto Magic the Gathering playing cards for her Tumblr, Magic Cards With Googly Eyes. Shortly after that, while cruising the internet for craft ideas and such, I encountered several blogs and online groups devoted to eyebombing. Then I saw Anne Wheaton and Bonnie Burton tweeting their own eyebombing adventures, with the now-widespread hashtag #vandaleyes. And it’s progressed from there. I’ve had a bag of googly eyes in my craft supplies stash for ages, because I have just about anything and everything in my craft supply stash. (Testing this has, in fact, become a favourite game among several of my friends when they come over to hang out and craft. “Hey Tally, do you have an exacto knife I can use?” “How about a wire cutter?” “Green felt, superglue and some vintage leaf-patterned wallpaper samples?” “I need a fuschia sharpie, some blue acrylic yarn, five bottlecaps and a rabbit cutout.” All in the futile hope that they’ll stump me.) Anyway, I never had a great deal of use for those stashed eyes. But then as googly eyes started popping up all over the place, I realized that they are fun and delightful and absolutely not limited to little kids’ craft projects. In fact, I suddenly realized that designating them as “for kid stuff only” would be as ridiculous as denying Crayons their rightful place in the ranks of excellent and worthwhile adult crafting supplies. Crayons, in case you somehow forgot this after grade school, are awesome. The point here is that googly eyes are fun. I still don’t use them in a huge amount of crafting, but they definitely have their place. On wine charms, for example, and holiday goodies like Easter eggs. Sometimes even on cloth bags – if you’re going for derpy, nothing quite says derpy like googly eyes. And of course you can simply stick them whimsically and amusingly to trash cans, toilets, door handles, hotel concierge desks, fire hydrants, gardening supplies, close friends and family members, total strangers, cats.Now, I figure that when doing all this eyebombing, it would be fun to outfit oneself appropriately for the occasion. 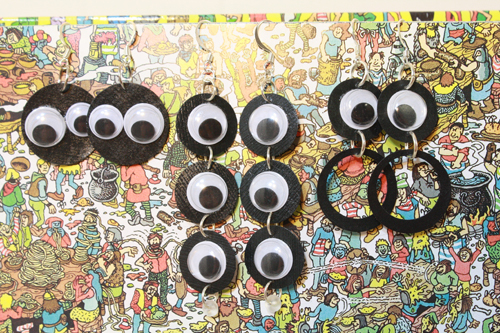 You may remember that I have a thing for stuff like eyeball earrings. 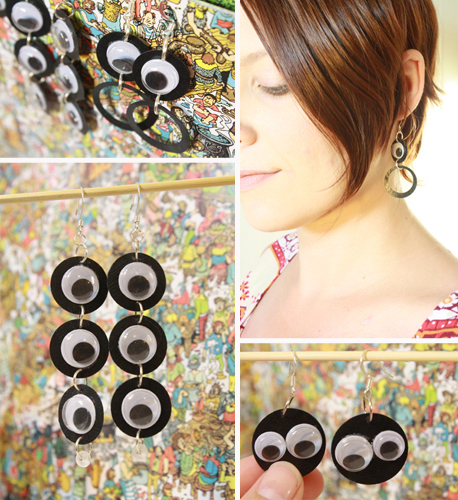 Googly eye earrings are slightly more subtle (I wore them around the office all day without most people looking at me any more strangely than usual), they’re wonderfully cheap and easy to make, and they’re lightweight. And of course instead of earrings you could do pendants or bracelets. 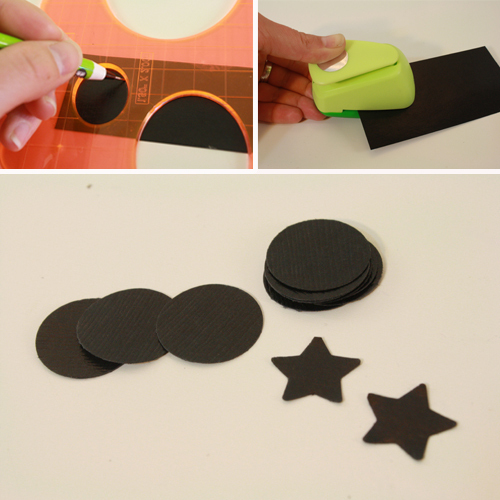 This tutorial is based on the exact same process as my tutorial for round paper earrings. Just add googly eyes! googly eyes! Any size, any colour. Craft stores often sell a whole variety of these, some plain black and white, some colourful, some with eyelashes, some that glow in the dark. black cardstock – or some other colour if you prefer. What’s important is the weight – it needs to be reasonably thick and sturdy. And you don’t need much – just 1 sheet of paper will make you a lot of earrings. If you have a paper stash, this is a good time to use up some small scraps. a circle cutter OR small circle punch OR a traceable circular item (or some other shape. You can do ovals, squares, stars, whatever. I just stuck with circles because I liked how they match the googly eyes’ shape and keep attention on the eyes. 1) Start with your paper and your varnish. Put a light coat of varnish on one side of your paper and let it dry. 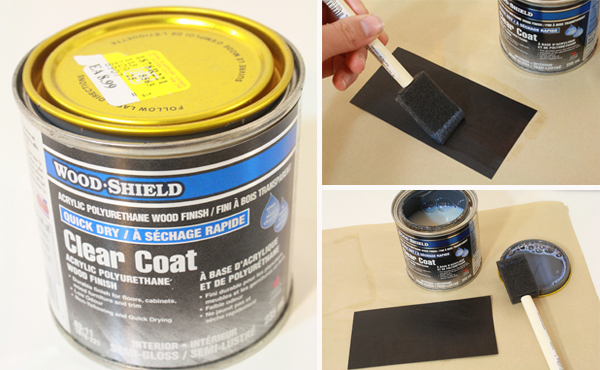 Try to avoid lots of air bubbles in the varnish on the paper – this is part of why you want to do only a light coat. The paper may curl up a bit as you varnish it – don’t worry about this. Once the paper is dry, put a coat of varnish on the other side of the paper and let that dry. I recommend at least two coats of varnish on each side. More than that is optional, and will simply serve to make the paper sturdier and more durable. 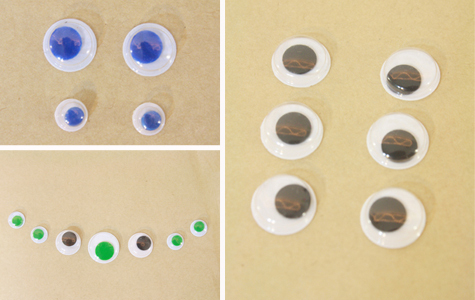 2) While the paper is drying, choose the googly eyes you want to use and lay them out. 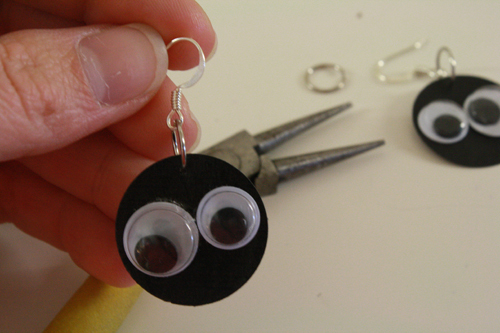 If you’re making earrings, you’ll want to have sets of googly eyes, so that the earrings will match. If you’re doing a necklace or bracelet, you might want to create a symmetrical (or not) line of eyes of different sizes or colours. Have fun, be creative. This step probably won’t take very long, so you’ll need to go do something else while the paper dries between varnish coats. Play some video games. Go outside and enjoy the sun. Or rain, or snow, or whatever else, depending. Start on another craft project – I’ve got a whole blogfull of ideas for you, and the internet is loaded with even more! 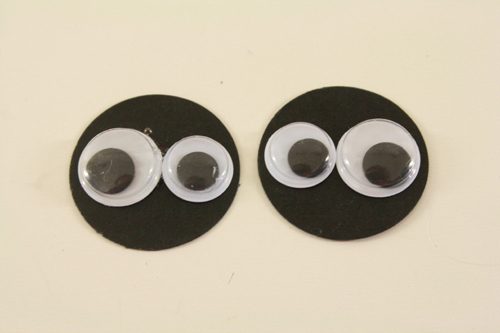 4) Once you’ve got your shapes, glue the googly eyes to their centers. 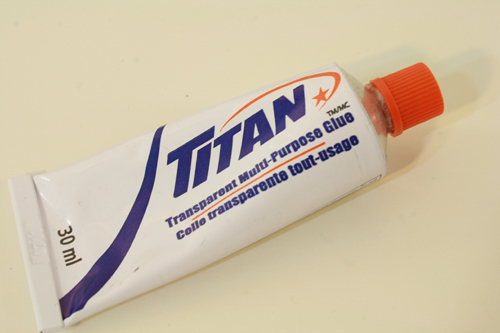 You’ll want to use a nice strong glue for this – my favourite is this Titan brand superglue I get from the dollar store. 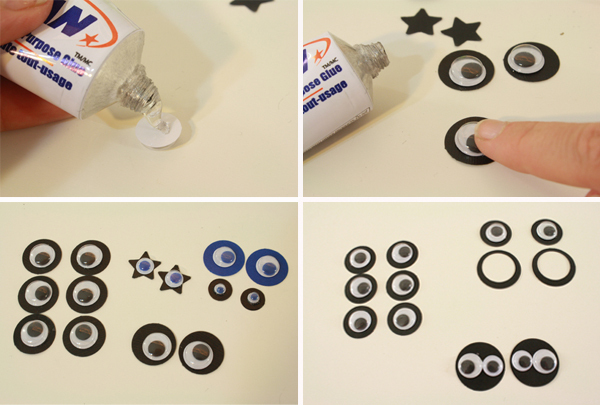 Try not to use too much glue – you don’t want it to ooze out the sides and look messy around the edges of the googly eyes. 5) Let the glue dry completely. And keep in mind that this may take a little longer than usual, as the glue is drying to a varnished surface. 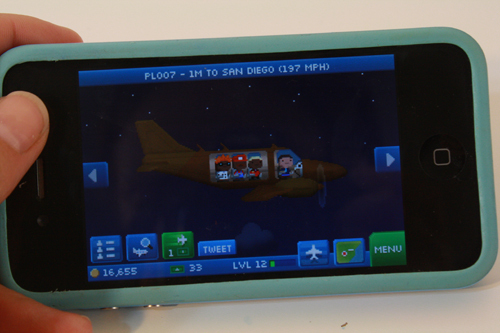 Go back to those games or other craft projects for a while. Take a nap, walk the dog, get lost in a Wikipedia loop. 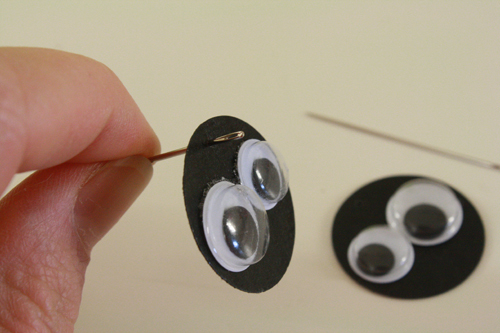 6) Once the glue is totally dry, take up your small needle, and one of your googly eyes on a paper backing. You’re going to poke a hole near the edge of the paper on one side. This hole is where the jump ring will go, to attach the eye to whatever jewelry findings you wish. 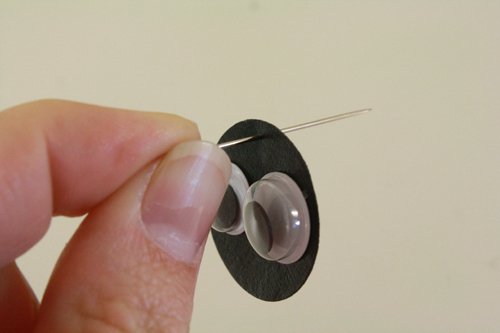 7) Now take your larger needle and poke it through the hole, enlarging it. Wiggle it around a bit – gently – to enlarge the hole further. 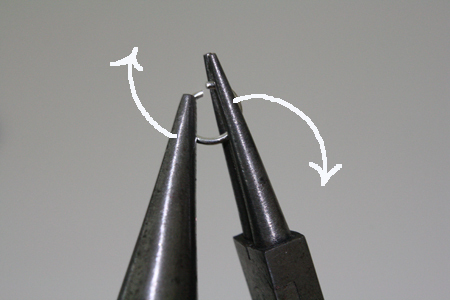 You do it this way – small needle first, then larger needle – because starting with a larger needle puts more pressure on the paper and is more likely to cause the paper to bend and crease as you try to poke the needle through it. So you do it sort of the same way people use those gauged earrings to gradually enlarge the holes in their ears. But maybe don’t think about that if such things make you squeamish. 8) Now take a jump ring and open it up. Insert it through the hole in the paper, but don’t close it yet. 9) Insert whatever other jewelry finding you want into the jump ring. You might want to make a chain of googly eyes, in which case you’ll insert the jump ring into a hole in another paper shape, then close the ring. Or you might just stick an earring hook on there and close it up. 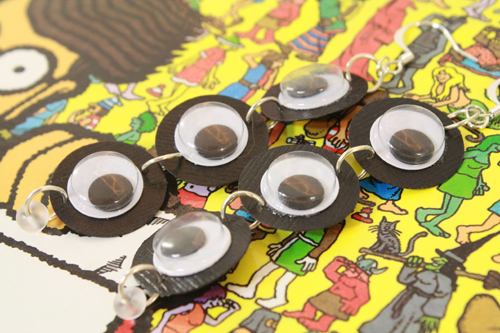 Or you could close it up and put a chain or cord through the ring to put your googly eye on a necklace. If you decide to do a chain of googly eyes, you’ll want to make another hole in your googly eye piece exactly opposite the first hole. 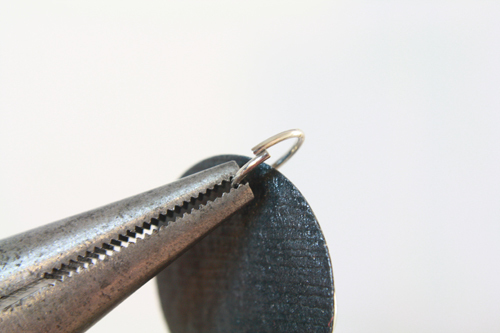 Make a small pencil mark where the hole should go, then repeat steps 5 and 6 to make the hole, and attach to other googly eyes and jewelry findings as desired. If you want, you can also glue a second googly eye on the other side of each paper circle, so you’ve got eyes on all sides! 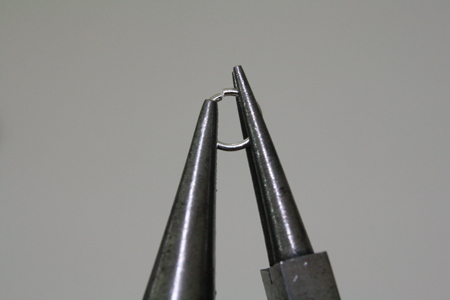 To open a jump ring, use two pairs of pliers. Find the break in the jump ring. Grip one side of this break with one pair of pliers, and the other side with the other pair. Pull one set of pliers towards you, while pushing the other set away. 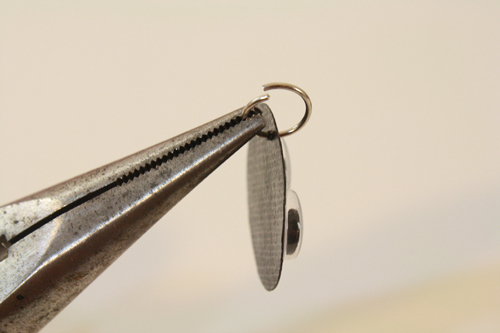 This will open the jump ring, pulling its sides apart, but keeping its circular shape and thus making it easier to push it neatly closed again later. 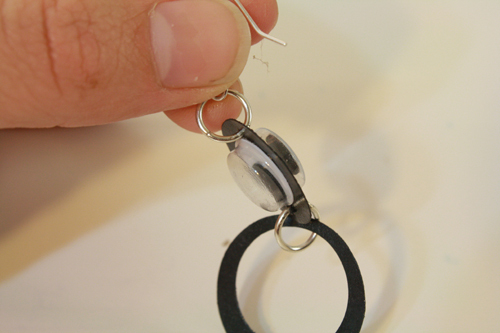 Now insert the desired object(s) onto the jump ring, then close the ring by simply reversing this process, using the two pairs of pliers to push and pull the ends of the ring back together. This is much neater than pulling the jump ring’s ends apart in the other direction, and doing it this way, you don’t risk losing or warping the ring’s round shape. 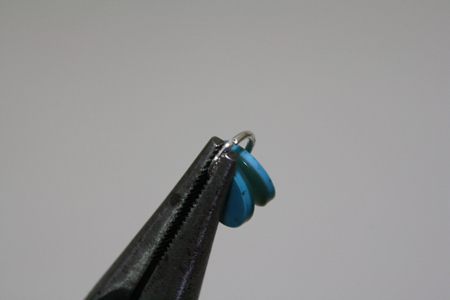 That said, given that you’re working with paper here, which is very thin, you may also want to squeeze the ring together just a wee bit the other way, so that the ends overlap as in the photo below. This should completely prevent the paper from slipping out of the jump ring, which can happen even when you think you’ve closed the ring up super well. 11) Get creative! Try different patterns, add beads and plain paper shapes or loops to the design, do whatever other fun things you can think of.